Arlington, VA – January 26, 2011 – This Valentine’s Day, PBS KIDS teaches children about the value of friendship with special NEW episodes of THE CAT IN THE HAT KNOWS A LOT ABOUT THAT! and WORDGIRL®. 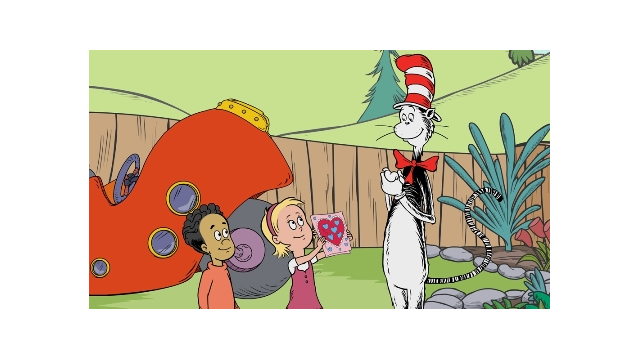 In “Pick Your Friends/Finola’s Farm,” the Cat teaches Nick and Sally a valuable lesson about friendship. And in a new WORDGIRL episode, “Cherish is the Word/Granny’s Intuition,” WORDGIRL rescues stolen Valentine cards and saves the day. Other PBS KIDS favorites, including CLIFFORD THE BIG RED DOG®, SUPER WHY!, ARTHUR, CAILLOU and many more, will also feature Valentine’s Day-themed episodes throughout February. Kids can watch Valentine’s Day episodes on-air and online at PBSKIDS.org/video and PBSKIDSGO.org/video. Parents can also find festive Valentine’s activities to do with their children at PBSPARENTS.org, including poetry-writing activities, craft ideas, and healthy recipes that families can make together. Following is a listing of the episodes airing this February in celebration of Valentine’s Day (Check local listings for air dates and times). THE CAT IN THE HAT KNOWS A LOT ABOUT THAT! – “Pick Your Friends/Finola’s Farm” NEW (episodic images available on PBS PressRoom) “Pick Your Friends” – It's Valentine's Day and Nick and Sally can't agree on how to decorate the card they're making for Cat. Does this mean they aren't really best friends? Cat takes them to meet Sheldon, a tortoise who knows all about friendship. They learn that Sheldon's best friend is completely different than he is and that being best friends doesn't mean you always have to agree. “Finola's Farm” – Nick and Sally are trying to have breakfast but have run out of milk. The Cat arrives to take them to Finola's Farm to have breakfast with Finola. First they learn how to milk a cow, then they discover that cow’s milk can be made into butter, cheese, and best of all - ice cream! WORDGIRL – “Cherish is the Word/Granny’s Intuition” NEW (episodic images available on PBS PressRoom) “Cherish is the Word” – It's Valentine’s Day! All of the kids at school are making special valentines to share with their special friends. But when Victoria Best runs off with all of the cards, will she ruin Valentine's Day for everyone? It's up to WordGirl to swoop in and save the day. “Granny's Intuition” – According to the local news, Granny May seems to be figuring out who's been committing the latest crime sprees that are sweeping the city. When Granny May chalks it up to her intuition, WordGirl has a hunch that this villain hasn't changed her ways. CLIFFORD THE BIG RED DOG - “Big Hearted T-Bone/Cleo’s Valentine Surprise” and “Clifford’s Big Heart/Cleo’s Valentine Surprise” Valentine’s Day is Clifford’s favorite holiday – not only is he big and red with a big heart, it’s also his birthday – so he’s celebrating with a three-day event on PBS KIDS called “Clifford’s BIG Valentine Celebration,” featuring the following Valentine’s-themed episodes of CLIFFORD THE BIG RED DOG and CLIFFORD’S PUPPY DAYS™. “Big Hearted T-Bone” – T-Bone offers to watch Cleo’s niece KiKi so she can get some rest. But his honorable intentions are challenged when his friend Mimi comes to town. T-Bone must choose between responsibility and fun. “Cleo’s Valentine Surprise” – With some help from K.C., Cleo goes overboard preparing a special gift for Clifford and T-Bone. When she doesn’t get a big gift in return, Cleo learns to recognize the joy in giving. “Clifford’s Big Heart” – Clifford works hard to try to make Emily Elizabeth the perfect Valentine to show her how much he loves her. In the end, he learns that it's his presence, not presents, that means the most to Emily Elizabeth. CLIFFORD’S PUPPY DAYS - “Valentine Schmalentine/Sweethearts Dance” “Valentine Schmalentine” –Clifford and Daffodil get competitive over who can make Emily Elizabeth the best Valentine’s Day gift. In the end, they realize she would love whatever they give her, because she loves them. “Sweethearts Dance” – Emily Elizabeth’s excitement about the Father-Daughter/Mother-Son dance at the Community Center turns to anxiety when she realizes she and her dad must dance together in front of a crowd. SUPER WHY! – “Cinderella: The Prince’s Side of the Story” Red Riding Hood and Little Boy Blue are playing some music together when Little Boy Blue suddenly disappears! This is just like when Cinderella left the ball without finishing her dance. To solve the mystery, Super Why and his friends soar into Cinderella's fairytale once again, and this time they talk to the prince! CAILLOU – “People I Love/Springtime for Caillou” “People I Love” – It's Valentine's Day and Caillou finds a mysterious card addressed to him! A little investigation leads him to his secret admirer: a little sister with a big heart. A rainy day gets brighter when Caillou discovers an old photo of a younger Grandpa and Grandma dancing and then learns to dance himself. When Dad's baseball team is playing a game at the park, Caillou becomes the water boy and does a great job. When Leo comes over for a sleepover, Caillou has to learn that the guest comes first. When Mom and Rosie go to the store, Caillou stays at home with his Daddy and has a lot of fun. “Springtime for Caillou” – On Valentine's Day, Daddy surprises Mommy with a bouquet of roses at breakfast, and the kids in Caillou's class make valentines for their friends. Caillou is sad when his snowman melts away in the warm spring sunshine. Daddy plays an April Fool's trick on Mommy, setting all the clocks ahead one hour. ARTHUR – “FLEA TO BE YOU AND ME/KISS AND TELL” “Flea to Be You and Me” – Pal is itching like crazy and the culprit is Pepe, an Italian circus flea. To save himself from being "squeeshed," Pepe enthralls Kate, Pal, and Amigo with the story of his heartbreaking separation from brother Sale - followed by an incredible journey across four continents! “Kiss and Tell” – Emily returns from her summer in Paris with the amazing news that she's been kissed - by a boy! Just like in a fairy tale! Now D.W. wants a kiss so that she can be a princess too. But where can she find her Prince Charming? WORDWORLD – “My Fuzzy Valentine/Love Bug” “My Fuzzy Valentine” – Bug wants to sign a valentine for his favorite WordFriend, but he doesn't know how to write his name. With lots of encouragement from Frog, he learns that with a little practice he can write his name and give his valentine. “Love Bug” – When Sheep decides she wants to make a special Valentine song for her pal Bear, she has trouble finding just the right rhyme to finish her song. With the help of Fly, she discovers the perfect rhyme and makes Bear a Valentine song with real heart. CYBERCHASE – “Hugs & Witches" It's Valentine's Day, and Hacker captures Dr. Marbles and Lady Ada Lovelace, placing them inside a time machine invented by the mathematically-minded Lovelace. The kids and Digit must decipher a series of poems left behind by Lady L and free them from the time machine before it time travels to the nether world of Cyberspace - never to return! Will the kids get there in time, or will Valentine's Day bring nothing but broken hearts? BARNEY & FRIENDS™ - “Caring Hearts” A school project provides a perfect opportunity for Barney and his friends to learn about love and relationships the “heart” way as together they make a “Friends and Family Tree.” Songs and games provide a fun way to remind them that good manners, sharing, taking turns, being helpful and showing kindness are all ways of being nice to people whom we love and care about. The children learn there are many people who care about them and want them to be safe. ANGELINA BALLERINA™ THE NEXT STEPS “Angelina and the Big News/Angelina’s Secret Valentine” “Angelina and the Big News” - Angelina, Viki, and Marco mistakenly think Ms. Mimi is getting married. They go to great lengths to make her wedding day special – and learn about wedding marches and organ music in the process. In the end, they realize they made a big mistake. But it’s okay – everyone makes mistakes! “Angelina’s Secret Valentine” - Angelina finds a Valentine’s card from a secret admirer on her door step. She and Polly seek out their friends in an attempt to solve the mystery of who sent the card. They are pleasantly surprised to find that Ms. Mimi, the culprit, gave cards to all the Camembert mouselings. They repay her with their own special Valentine – a dance expressing their appreciation. “Angelina and the Hearts on Ice/Angelina’s Kitchen Band” “Angelina and the Hearts on Ice” - It's Valentine's Day! Angelina and Alice are excited to perform a love-themed skating show during halftime at Chipping Cheddar’s big hockey game. Marco thinks he is being asked to join the hockey team and is less than enthusiastic when he finds out that he has to participate in Angelina and Viki's performance. Eventually, Marco realizes the importance of his part and, in the end, learns to make the best of an uncomfortable situation. “Angelina’s Kitchen Band” - Ms. Mimi takes the mouselings on a field trip to show them that music is everywhere: lots of things can be used to make music! Gracie doesn’t see the point in finding other ways to make music when they have such great instruments at school. With the help of her friends and Mrs. Thimble, she discovers that learning can be fun and inspiration can be found even in the most unlikely of places! PBS KIDS, the number one educational media brand for kids, offers all children the opportunity to explore new ideas and new worlds through television, online and community-based programs. More than 21 million children watch PBS KIDS on TV, and more than 21 million engage with PBS KIDS online each quarter. For more information on specific PBS KIDS programs supporting literacy, science, math and more, visit PBS.org/pressroom.